In other news, I broke my 200 book goal for reading in 2018 and at the time of writing this (the last week in November), I'm at 210. I have a forthcoming post about reading practices that may highlight some of this. As I close in on December though, I'm hoping that I achieving my other reading goal of the year which is to read at least 24 physical books. I read lots of physical books but usually only portions and usually only related to my dissertation. Rose undermines a deep assumption of the modern world; the primacy of average. He illustrates that throughout society, we use the average as a litmus test for judging all things, even though no singular person ever meets all the criteria of the average. 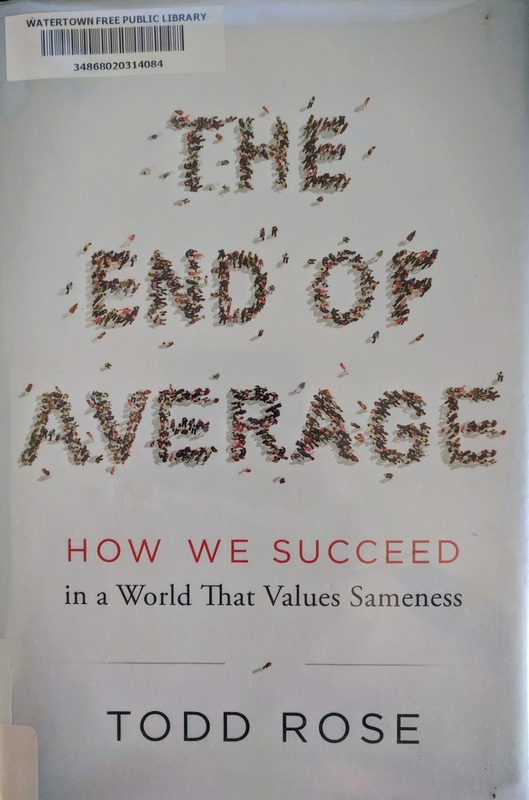 After unpacking where the concept of the average came from and how it came to dominate our society, he then questions the usefulness of it in a variety of situations. He flips the idea of trying to get everyone to adhere to the average and asks what happens when we make thinks flexible to the individual. His iconic example is fighter pilot cockpits and how until they were made to be adjustable to the individual, rather than the "average" body, they inevitably failed in making humans more effective flyers and fighters. Anchoring this as his most visceral point, he then moves into looking at how different aspects of society (health, work, school) conform to this principle and in doing so, what it misses out. For example, he illustrates how our obsession with the average dominates how we view babies and their progression and because the concept of average boils things down to a single number or representative structure, it removes opportunities to consider different paths. With babies, he notes that society's sense of progression of crawling to standing to walking is the assumed way, even though newer research shows us that this is not the case. In fact, there are several different methods for achieving walking for babies and we're largely informed by a modern Western world, where babies crawling on the floor is a norm because we assume that it's safe. In other parts of the world, crawling to walking doesn't make sense because being facedown on the ground can be a dangerous place for a baby--yet they still learn to walk without crawling. All of this is to say that Rose has many good points in unpacking this concept of average and the ways it limits our thinking and our ability to maximize the possibilities in individuals and in society. Where he seems to falter a little (at least for me) is his argument that higher education suffers from this investment in average (that part, I do agree with) and an example of that are degrees that don't train for a specific profession. He grounds his argument in showing that degrees someone how all come out to the same amount of time (e.g. 4 years and a certain amount of credits) with no guarantee of a specific set of skills. Now, this seems out of place since, in previous chapters, he talked about how the work environment was fixated on the average in how it evaluated employees, how it conceived of positions, and how it saw the role of its employees in the organization. The ultimate outcome of that was that companies should be flexible to the individual for maximum benefit. Therefore, to then argue that colleges should prepare students for specific professions (which in itself are positions conceived of conceptions about what the average profession should be able to do), seems a blind spot. Coupled this with the fact that while degrees are often credit based, they are much more flexible than he lets (e.g. he seems to ignore associates, masters, and doctorates or certificates, for that matter) and his focus on education feels a little bit shoddy. Regardless, I found it quite useful in rethinking how I conceptualize and consider the role of average in my personal and professional life. Hacker and Pierson present a striking, convincing, and important argument for the American electorate: government has and continues to be an important facet of growth, success, and improvements for individuals, businesses, and society as a whole, but a sustained and broad-sweeping effort by conservatives over the last 80 years has left many Americans blind to this. They structure their argument first by delving into history to show the ways in which a prominent government that played an active role in a mixed-market (as opposed to free market) was the foundation of the United States and the ways in which it has done so through from the 1800s and the expansion of the railroads to providing increasing balance and protection for citizens against the Robber Barons of the Gilded Age and then, of course, in the Post-WOrld War II boom in which they funneled money in research, medicine and the like, creating inventions, technologies, medical breakthroughs from which all Americans benefitted. They identify historically how different leaders of industry understand and even appreciated the role of government. They highlight how Republican leaders from President Wilson to Vannevar Bush to President Eisenhower to even Richard Nixon saw that government has a key role to play the mixed market and it creates more opportunity for growth. However, by the mid-20th century, conservatives have worked tirelessly undermine government through dark money, think tanks, media, and intentional obfuscation. 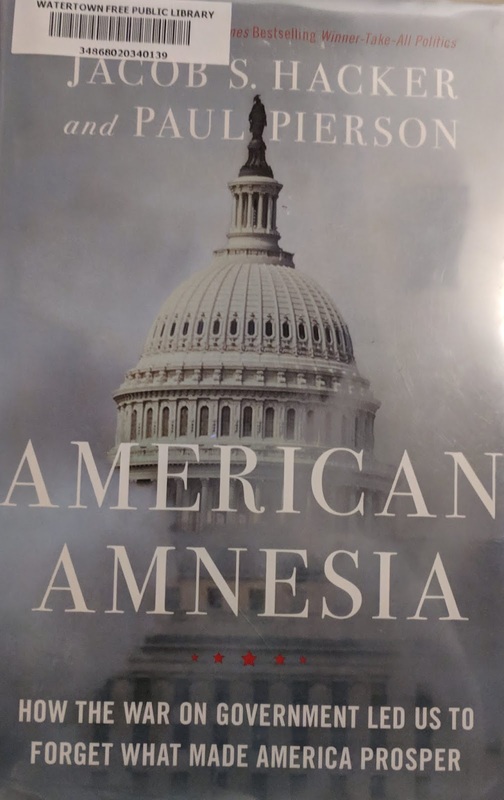 One main method the authors go into substantial depth with is identifying how often conservatives create the problem in government and then point to the problem as evidence of government as a failure. Often, they do this by slowing down the governing process (when they are the minority) so that nothing gets done or by defunding or restricting government entities (when the majority), the resulting failures that result become the proof that such endeavors are wastes of taxpayers' money. It is a powerful and frustrating book, more so when one gets to the end and think about how much of this has gotten worse under the Trump administration (published in 2016, some of their conclusions and points anticipate the ways in which conservatives have behaved in the time since). Forman takes a delicate position in the discourse on racism within the criminal justice system. 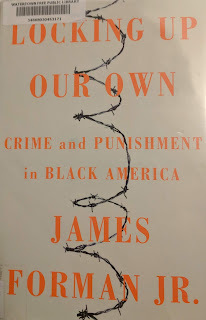 He easily articulates the points that many others have offered up to illustrate that since the end of slavery, the criminal justice system within the United States has been used to disproportionately disrupt and disenfranchise the lives of people of color. He never waivers from that but offers an insightful and critical consideration of the role that the African American community has played in the mass incarceration of other African Americans. In this way, his work fits in nicely with From #BlackLivesMatter To Black Liberation by Keeanga-Yamahtta Taylor and Stamped from the Beginning: The Definitive History of Racist Ideas in America by Ibram X. Kendi. Forman is not trying to undermine ceaseless battles that people have had to fight but rather draw out the nuance of how those battles have lead to productive and unproductive outcomes. In this case, Forman's point is that many African American communities argued for increased sentences (in particularly, mandatory minimum sentencing) for drug, gang, and violent offenses. But he makes sure to emphasize that this was not the sole practice of the African American communities but part of a three-prong approach that included additional community resources, education, and better social systems. However, those ideas largely feel on deaf (white) ears. Forman incorporates other relevant topics such as black on black crime (something that African American rallied to be taken seriously for decades because the courts did not care) and the distinction of class within African American communities and how this created different encounters with the criminal justice system. However, what's most compelling about Forman's book is how he gives readers a glimpse into these issues. Forman made a conscious decision to become a public defender and so for each of the issues that he's exploring he starts by introducing the reader to one of his defendants and explaining how the past decisions made by racialized criminal justice system and coupled with voices within the African American community have generated the situation that his client is facing in each chapter. It's a powerful means of connecting policy to outcome and helping readers understand the depths of the problems and how pervasive they are within the criminal justice system. Schreier provides a bird's eye view of the development process of some of the most established games of the late 2000s and 2010s. Through some 100 interviews, he explores a mixture of indie games to mega-production games and how they came into being (including one that did not). Each chapter delves into a different game and Schreier creates a narrative structural arc of how the game concept came into being to how it was released, including appropriate quotes and context as needed, often ending the story just after launch (sometimes with a follow up of 1-2 years after). In general, the chapters provide great contrasts such as when he explores the development off indie games like Stardew Valley (an ode to Harvest Moon) or Shovel Knight (a 2-D side-scroller in the tradition of Mega-Man) compared to Uncharted 4, Halo Wars, and The Witcher 3. 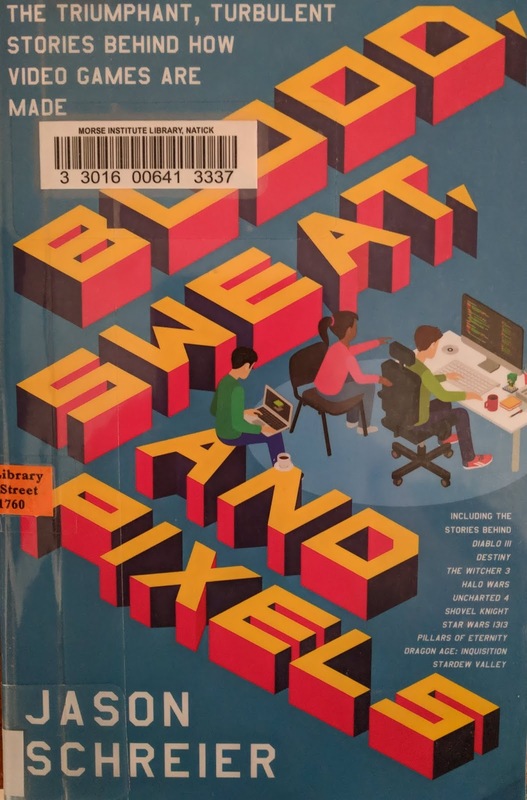 These explorations enlighten readers, especially those with little knowledge of the video game industry, insight into the extensive work needed for each and every game that they may be picking up. His insights are revealing and information on how and why there are delays, the attention to detail that most game-developers provide for their game, and the challenges of having to rethink and redo entire sections (if not the entire game)--and how heartbreaking or frustrating that can be for the developers. A poorly developed theme in the book is about how much the game industry is reliant on crunch--that is, the process leading up to the game release where all involved in a game's launch are expected to be "All hands on deck" and work ridiculous hours to make it to release date. He mentions it fairly consistently and his conclusion would lead one to believe that he has provided an in-depth analysis of it. Yet the reality is, his critique with this issue in the game industry (an issue it is as it requires those involve to forsake their mental, physical, and emotional health to meet an often artificial deadline) feel empty; mentioning it but not really digging into the elements that allow it, the research that could challenge the logic in it, and such. 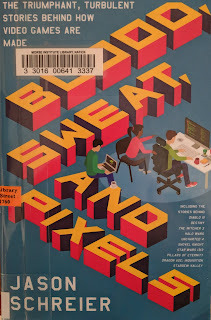 Despite that, the book is still a fascinating trek into the world of video game development that many will appreciate and others find illuminating, particularly if they tend to think of video games as irrelevant and simple things. 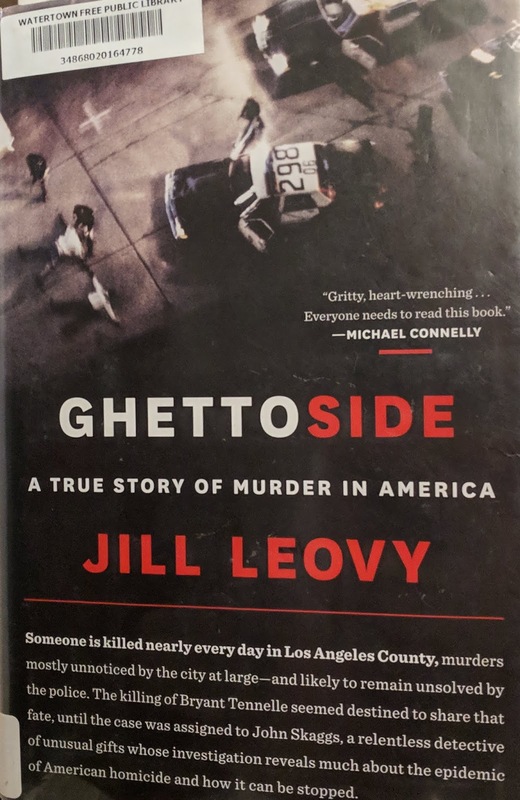 At the center of Leovy's masterful investigation is a nuanced critique of how American society investigates crime and where it so often puts its resources and emphasis in the criminal justice system. 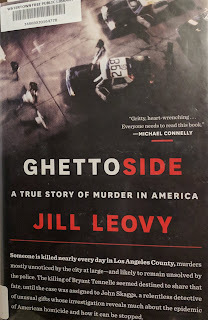 By examining how a determined homicide detective pursues the murder of a fellow officer's son in Los Angeles, Leovy shows that there's a fascinating intersection between the historical racism of the criminal justice system with the underfunding of homicide departments, particularly in urban and impoverished area that create a system of violence and murder that impacts many people's lives in urban environments. What I appreciate about the author's work is that she humanizes both the police, the criminals, and the people who must navigate their lives between them. Additionally, the book as a whole is constructed around the murder of and pursuit of the murderer through the officers' dedicated, diligent, and skillful work. This narrative is supplemented with side-stories that cover the historical and social context that create the contours of the narrative such as the underfunding of the homicide police, the failure of criminal justice systems to invest and worry about violence against black bodies (be it by other people of color or by white people) to how challenging it is for people to feel safe in coming forward to identify suspects. Taken together, she offers us a glimpse of what effective homicide detective work can look like when someone has the motivation to go beyond the limited funding and bureaucratic hurdles that stand in their way. Peterson's book has much to say but I'm not sure it has much to offer. In many ways, it reminds of Ayn Rand's Atlas Shrugged. On one level, both serve as guides for how individuals can build themselves up and strive in a modern, complex society. On the other hand, the ideological tenants that drive the authors and infuse the texts are detrimental in the social sense. For Rand, it creates sociopathic selfish individuals when enacted as a social practice, but for Peterson, he woefully mixes shoddy-history and pseudo-scientific views with a hodge-podge of theological and literary interpretations to create a tapestry that swings back and forth between our Darwinian and biblical origin, making it fit nicely by disregarding all the many things that don't fit neatly into how he is ordering the book. Layered upon this is a gendered vision (man is order, woman is chaos) that renders what he writes as clearly directed toward and relevant to men--occasionally throwing a bone to women in his examples but usually dismissing or paying lip service to respect. It's also often filled with contradictions (a Darwinian-based belief that men seek dominance through violence, but it's the feminist movement that casts men's actions as general destructive; you should embrace culture and its traditions but if it's not a culture that he approves of, it is clearly in need of eradicating) that undermine his very advice. His examples abound with examples of how other people didn't learn the tenant or live up to it, but so very rarely does he deeply personalize the advice that it makes him seem born as fully-formed perfection. In fact, it's this holier attitude that makes me understand so much of why Natalie Wynn in ContraPoints calls him "Daddy." He can't seem to stay focused on his rules without going off into terrain in which he fixates on communist Russia or China or harangues that scholars in academia are at fault for the problems that his rules for life will indelibly fix. His emphasis on the violence and brutality of Russia and China as a result of their politic lens (Communism) seems absence of irony given the equally damning and violent societies that capitalism has also produced. These deviations are too bad because there are things that Peterson says that I can agree with such as effective body communication (the old, "fake till you make it", which he frames as "stand up straight"--though some of the science on this by Amy Cuddy has been recently called into question) or understanding one's inner workings or simply not lying. And that's just it, the what you should do is not hard to agree upon because it is what makes up so much of pop-psychology books everywhere. Rather, it's the pathway that he takes to get to it, invoking Adam and Eve as our supposed literal ancestors, and overwhelmingly endorsing capitalism as virtuous while never missing a chance to slam the grotesque actions of non-Western and non-capitalist ideas. In that way, it feels like he's arguing that the Western man (and very much man) is the best of all forms. Taken his approach, it is no wonder why so many on the right (and far right) take to this ideology because it is likely to reposition them as the more rightful (powerful) people in the world. What have been some of your most recent reads of late? What book do you find yourself recommending to everyone? What author(s) can't you get enough of?